If you have an e-commerce website, or are planning to implement one, there are a few things you can learn from a phenomenon known as “shopping cart abandonment.” Users on e-commerce sites tend to leave behind loaded shopping carts at an alarming rate. But how big is the problem for online retailers and what can you do to limit shopping cart abandonment? Your pages had better load quickly! Nearly half (47%) of all online consumers expect a web page to load in 2 seconds or less. Despite the fact that there are many factors not directly under your control, shoppers (and non-shoppers alike) won’t tolerate a slow website. What can you do to navigate this particular pitfall? Give your Web server a robust, reliable connection to the Internet for starters. Second, make sure your pages include only the resources they absolutely need to operate. Don’t include extra scripts or unnecessary functions, and avoid using eye-catchers like Flash, that take precious time to load, and get only questionable support from the newer browsers. Figure out your shipping strategy. More than 40% (44% to be exact) of online consumers bail out on a potential sale due to the high cost of shipping. Freight charges can double the cost of a small order, so consumers shy away from paying high shipping costs, especially if the product is available locally. Consumers are willing to wait for their purchases if they have a low-cost (or no-cost) shipping option. Work with courier services to secure as many low-cost shipping options as possible. Tackling this issue head-on will limit shopping cart abandonment and produce real results on the bottom line. It pays to compare – for consumers, anyway. Nearly one-third of shoppers leave their loaded shopping cart behind because they’re just comparing prices. To limit shopping cart abandonment for this reason, make your pricing information available without requiring shoppers to add a potential purchase to their carts. Some sites use this technique in the hope that once an item is in the cart, the shopper will close the deal, even if they find a better price elsewhere. Instead, this strategy just invites shopping cart abandonment. Show your prices up front, and be explicit about any deals or discounts the shopper may receive. Monitor your stock carefully! If your site reports the “in-stock” status of a product, know that 15% of online shoppers will kill a deal if one or more products they’re looking for is out of stock at the time they’re shopping. Immediacy is important to online shoppers, and if you don’t have something in stock, these buyers will find someone who does. To avoid shopping cart abandonment for this reason, offer to ship items separately if stock shortages prevent you from fulfilling an order immediately. Have a “Sale” section on your website. Nearly 2 out of 3 online shoppers want to see a “Sale” or “Clearance” category on shopping websites. They want to browse the bargain bin! Bow to this demand, and point your visitors directly to your best deals. 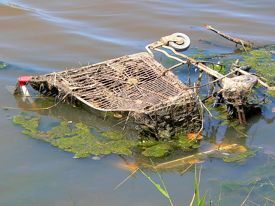 Will this prevent shopping cart abandonment? Maybe. If your visitors can find a great deal on your clearance items, they may also load up on your regular priced merchandise, too. If you would like more information about e-commerce website design, and what you can do to limit shopping cart abandonment on your retail website, please contact our Creative Director, Dave Ramsell or give Dave a call at (330) 243-0651 to set up a consultation.